We are so excited to share another project we worked on with Malabrigo. 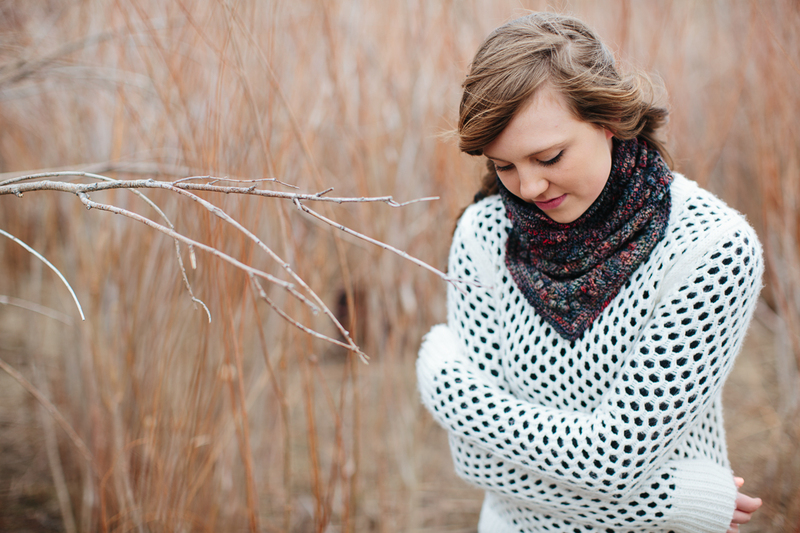 Much like our Wyoming Collection, this project is also inspired by the West: The Casper Mountain Cowl. Both fashionista cowgirls and cowboys with rugged-good-looks can totally rock this look. The pattern is part of Malarbigo’s Quickies: patterns using only one or two skeins of yarn. 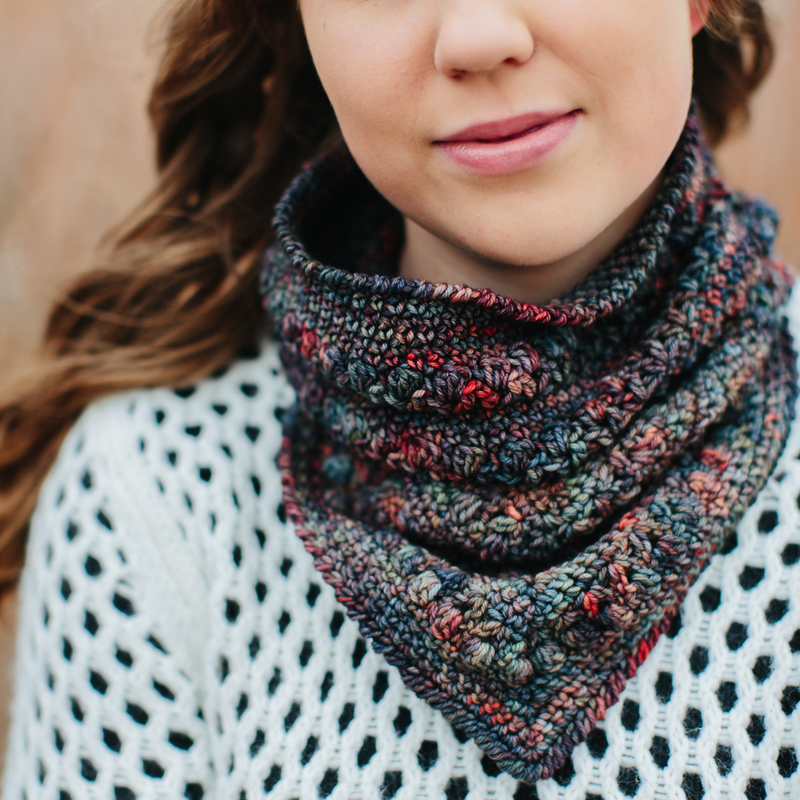 This pattern uses less than one skein of Malabrigo Arroyo. This yarn is my all-time favorite. It’s a DK light weight yarn that has beautiful stitch definition. You can follow this pattern using any DK light weight yarn, but the special stitches in this design really stand out when paired with Arroyo… I highly recommend it. The colorway is “Pocion” and I’ve never worked with it before this project but now I’m thinking of other uses for this incredible “potion” of hues. We chose this rich color combination because of it’s versatility; it seemed like one both men and women could wear. This design is a great gift for those pairing sundresses and cowboy boots this summer or for those who want to add a little warmth to the neckline of a linen shirt. Be well, dear readers. Crochet often. Create always! Previous postCrochet World Magazine & The Firefly Hook! First of all, when I saw Malabrigo, I was SOLD! Even though I cannot afford it – buying that is so worth it! The first time I worked with Malabrigo Silky Merino I thought I’d died and gone to heaven…what a delight to work with! And this scarf/cowl..is just great! Trouble is, I am having a hard time finding that colorway…and it is soooooo pretty! I’ve put the pattern in my favorites (Ravelry) and am keeping it in mind..WHEN I can afford, I will buy the pattern — and try to find this colorway…else, I might just make with the Silky Merino I have in my stash…will still be pretty, if not quite as colorful. Thanks for this….and for highlighting this wonderful yarn. It’s gotten to the point when I walk into a yarn shop, I can spot the Malabrigo from across the store…it IS the MOST BEAUTIFUL yarn out there!